The reasons are obvious, yet not everyone is paying attention to the details. Both phone models has almost same features, with the Pixel Phones appearing prettier than the iPhone 7 models with it’s better OLED display and Faster charging. But this is no longer the case, Apple reloaded and came back with outstanding iPhones. They were quick to note the change in trend and embraced the OLED display too. Google definitely dissappointed Android Users by not including this feature in the Pixel Phones because this is no longer strange in other android products. Meanwhile, Apple is very generous with this feature. Camera is always a major feature to look out for in smartphones. iPhone X has a dual camera which allows image to be zoomed maximally, while the Pixels only have one camera with no speciality. One of the camera lens in iPhoneX camera is responsible for zooming, the camera zooms Optically into objects without reducing the quality of the picture. If this is to be replicated using the Pixels, the image will be distorted. When new products surfaces, users are bound to make comparisons and usually, finding faults with the existing phones. This is the case for the Pixel Phones OLED display. Since iPhone X and Samsung Galaxy used the same screen, reports were filed against the Pixels for being blurry, users said the colours are not Sharp enough. Another case is the issue of ‘Burn-in’- this refer to cases in which the Android navigation bar remains on the screen even when it isn’t needed. 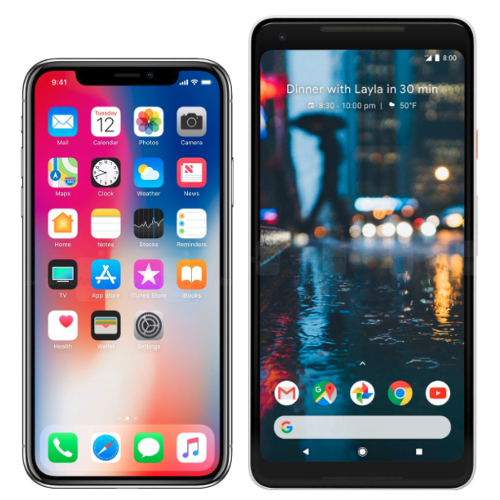 iPhone X has a stainless steel and glass body which makes it look better than it cost, meanwhile, the Pixel Phones features a coated mid-metal build, giving it an overall plastic feel. Beautiful but not sleek. The iPhone X also displays fully on its screen, from one edge to the other edge. while the Pixels leaves some uneven bezel portion behind. Apple seems to do it better; from apps to devices. Every Apple products are highly compatible, for example, transferring files between your iPhones and MacBook is ease and swift. However, this is not so with the Pixels and Chromebooks. Generally, users do not subscribe for Chromebook because of its limited abilities. Again, when you phone develops a fault, Apple has a strong customer service support in the many stores, while this is no so with Google repair shop…way too limited.